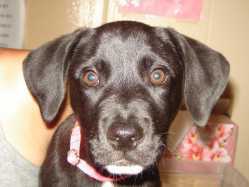 Bella is a 3 month-old Labrador mix. She would love a family to play with! She is available for adoption at The Humane Society of Southeast Missouri (573)334-5837. See more pets available for adoption at www.semopets.org. I hope she gets a great home. she is beautiful!!!!! if i didn't already have 2 dogs i would def get her. Oh my gosh!!! This puppy looks identical to the one I adopted from the Sikeston Humane Society about a month ago. Same white markings on the bottom lip and chest as well. Also the same age. PLEASE SPAY & NEUTER YOUR PET. Adopt from a shelter & stop the PUPPY MILLS!